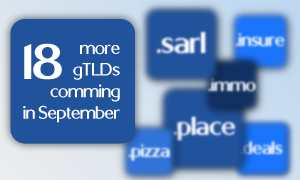 In less than nine months, over 2.1 million domain names have been registered under new gTLDs and another 18 domains are being released in September including .BUSINESS, .LIFE, .CHURCH, .FINANCE, .RESTAURANT, .PIZZA, and .PLACE. With the number of registrations exceeding two million, it seems clear that there is a strong demand for definitive and relevant domains globally. It attests to the ongoing evolution of the Internet. If you wish to take advantage of the newly released domains and mark your unique and relevant presence on the Internet, please click on the desired extension. Should you have any questions or need assistance, please contact our Support Team at support@web-solutions.eu or via phone on +44 (0) 208 133 3994.